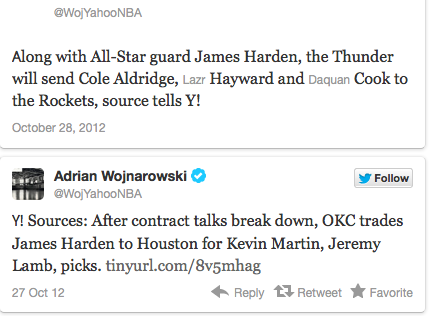 Well I must say I am one happy LAKER fan right now. 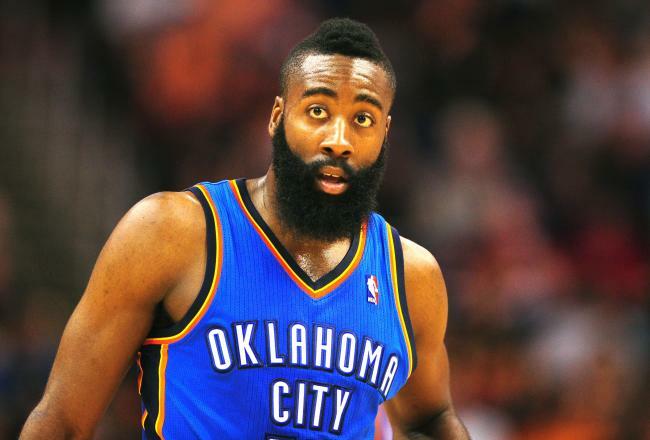 The Oklahoma City Thunder have just traded away their 6th man of the year, James Harden. Yep you read that right. Harden was up for a contract extension, that technically could have been revisited at the end of the season, but Sam Presti tried to get a deal done by the deadline of 10/31 offering James 4yrs, $53-54M. First tell me why that's not a good deal? James get's paid, and he stays on a true contender?! 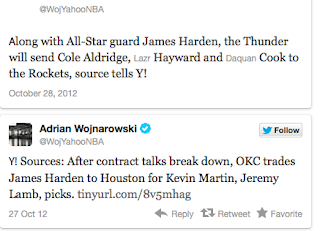 He get's traded to Houston, who will pay him a max deal believed to be $60M for 5yrs of service. Seriously, $6M is the difference here? This guy, along with Durant/Westbrook were the future for the OKC Thunder. I hope someone tells James that he has officially become the Joe Johnson of the NBA. He got his money, but he will be stuck at the bottom of the playoff pole, if he is there at all. Being a 6th man, & being THE MAN are two entirely different things. When you are keyed on night after night, with the role players he has..it's going to be a long 82 games. But hey, I'm a Lakers fan so I just say thank you! As for OKC, I understand you got Kevin Martin, & Jeremy Lamb in the deal along with picks...but Kevin Martin hasn't played a full 82 games since...well the beginning of his career. Yes he can score, but if he is not available for the playoffs what good will it do? And what about this chemistry everyone continues to talk about? People saying the Lakers will have problems this season because of possible chemistry issues, well please believe this is a totally different dynamic for this OKC team as well. The NBA season officially begins 10/30. I pray that DirecTV comes to terms with Time Warner Sports Net, in order for those in California can get the Lakers channel, as for me, NBA League Pass all day.